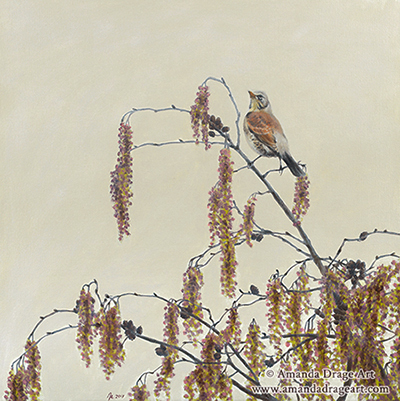 A closer look at one of my paintings for the project; "Fieldfare on Alder". First a little bit of backstory... Myself and Warren moved into our current home in Corby in the autumn of last year. There is a patch of green outside the front of the house, and our upstairs living room is a perfect vantage point for watching many birds flit in and out of the trees, and over the tops of the hedges. Towards the very end of that year, I was somewhat optimistically keeping an eye out of the window for Waxwings. No such luck with those, but I was very happy to see small groups of another of our winter visitors, the Fieldfare, hopping about on the green and taking brief rests in the young alder trees. When Matt chose the ten bird species to feature in this project, I was delighted that Fieldfare was on the list. 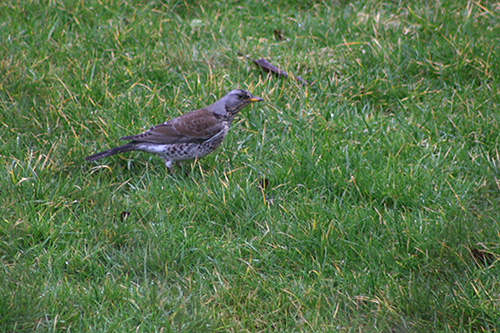 I had some snaps of a Fieldfare that had taken a moment to perch on one of the alder trees outside the living room. These became the basis for the Fieldfare painting. Perched on an Alder tree on the green. environment too. There were a couple of reasons for this. One was to tie in with the spirit of both the project and the Tree Charter - the trees are not just trees; they are homes, food sources, resting spots. Trees and birds are intrinsically linked. Another reason is that I don't often paint foliage, and so I wanted to challenge myself by including these elements in the paintings. I decided quite early on that I wanted to include a good portion of the alder tree in the painting - I found interest in the slender curved shapes of the leafless twigs and branches, with the colourful catkins dangling pendulously from the ends. 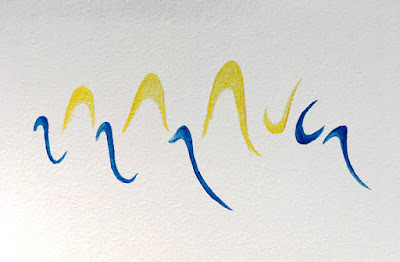 The painting would require careful composition. After some thought I chose a strong square crop, with emphasis on the form of the tree. The Fieldfare in the top right became almost a sidenote, echoing the brief blink-and-you'll-miss-it encounters we so often have with birds, and that I had experienced with this one. 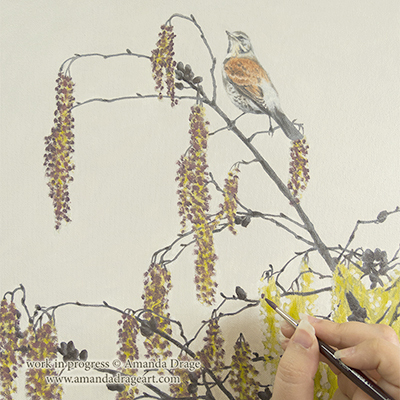 In progress: "Dotting" the catkins. I wanted to make sure I captured the atmosphere of the damp winter's day when I had photographed this bird. The cold wet air had a density that desaturated the colours like a sort of mist. The sky was a featureless curtain of yellow-grey. To add interest, I increased the warmth of the sky just a little, and gave it some very subtle variation in hue and tone that can only really be seen close up. Stood back, the sky still has the overall effect of a pale block colour, which lets the beautiful sweeping shapes of the foliage take centre stage.